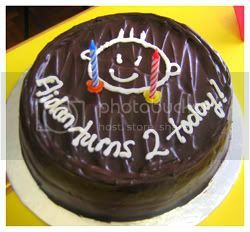 Aidan's 2! 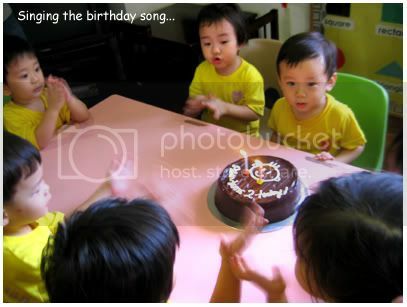 - A mummy's inane blabberings..
Was kinda fun to see him together with his playschool pals.When they knew it was his birthday, they all lined up and wished him 'Happy Birthday'..some giving him pecks on his cheeks or formally shaking his hands. 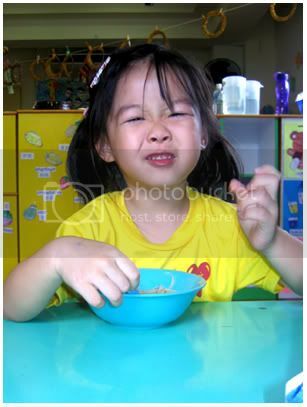 Very cute lah! Li' bugger had loads to eat today..He wanted cake the minute we'd cut it, and after finishing a big slice of it, he had his beehoon lunch, followed by fruits and another slice of cake.. His appetite is actually increasing..if that's even possible. 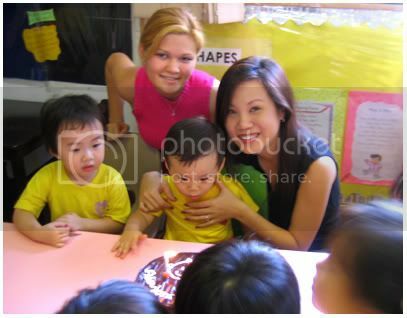 That's Heather, his playgroup teacher. She's an Aussie..
Aidan as usual is staring intently at the cake..
Had dinner with Irene moonberry and her bf Eric who was in Singapore for a stopover before she flies to Indonesia for her sis's wedding. It was great catching up with her especially since the last time I met her was during our holiday in New York..Brought her for seafood at Jumbo@ East Coast 'coz Eric wanted to see how the pepper crabs Irene has been cooking compares with the 'real thing'.. 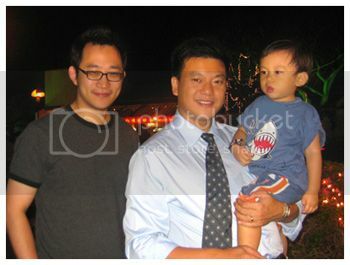 It was the first time Aidan met the couple and he really liked them, especially Eric. Aidan doesn't always let people carry him and he's usually quite selective. 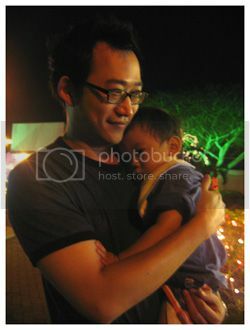 For example, he refuses to let my mom carries him (which hurt her quite abit)..But he was okay when Eric placed him in his arms..and then, he absolutely refused to let go of Eric, clinging to him like a koala! Even when YC and I tried to take over, Aidan pushed our hands away and kept saying "no no no" and held on tighter to him *headache*. Poor Eric had that 'oh no, what have I gotten myself into' look on his face. We were all commenting that it was a sure sign that Eric will make a good father and Irene was beaming away :D... And it was only finally after Irene tried to carry Aidan that he agreed to let go of his new found friend and was happily nestling himself against her. 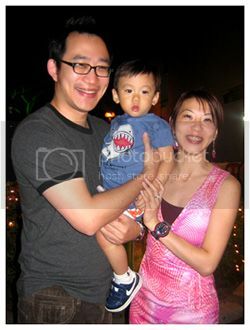 After that, he kept on running after Eric with open arms..
2 man and a li' boy.. He was almost falling asleep in his arms..
Hehe, he really does look very comfy in the last pic! Your husband looks so suave! Wow. & Aidan's eyebags are terrible for his age. Or did he just cry? Merry Xmas to u Jasmine, and ur 2 lovely daughters and ur famiily..and may ur new year be filled with joy..
And a bountiful xmas and a fab new year ahead to u n ur loved ones! Happy Birthday Aidan!! that cake looks super delicious!! Wishing you a fabulous xmas and a fantastic new year ahead! that cake looks soo goood!!!! 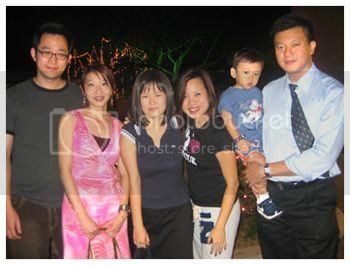 heh..the 2nd last pic would have been sweeter if it was another male hehehe..hubby jealous! 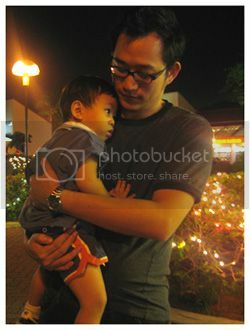 Man, Eric looks like a real dad with Aidan...hahaha..Irene must love the prospect of her boyfirend being a dad. They are such a cute couple. Yeah..they are such a sweet couple..
heh..Irene was saying to me.."looks like i must have a son" when she saw how good Eric was with Aidan. The thing is..they arent exposed much to kids and Aidan is one of the few toddlers that they get to be 'close' to so it came as a surprise to her. Next time, when u guys visit New York, u must let Eric carry Mandy!! Happy Birthday SIL and may your appetite be voracious as ever and stay cute and suave. Wishing you and ur family a blessed xmas. I wish u happiness (and that one mth will pass v fast)..I wish Edward good health and more blessings in the new year. And to ur two wonderful daughters..may their heart be continously filled with joy & laughter.. HAPPy birthday to youuuuuu!!! happy 2nd aidan! 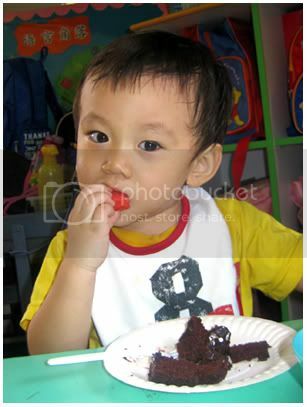 he looks so cute lah eating. Have a fabulous & bountiful xmas and a great year ahead! Awwww. Aidan looks so comfy in Eric's arms! Yeah..Irene's left for surabaya already tho she will be back for a very brief stopover on the 28th. will c if i can catch up with her. Merry Xmas to u and Andrew!! 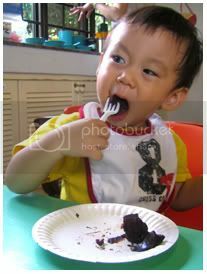 heh thanks..i think we overdose on choc fudge cake liao! Merry X'mas to u and ur hubby! Is it a white xmas there? 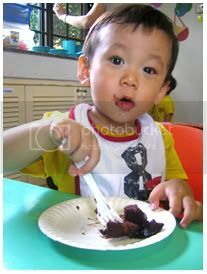 love the cake-smeared face photos...so cute. 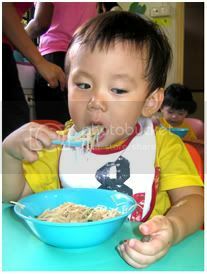 Heh..thats how he eats usually if we let him do it himself :P..all smeared with food. Happy birthday Aidan! 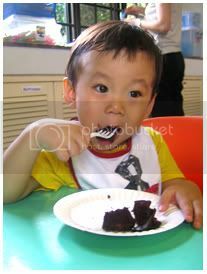 I'm truly impressed by your appetite, that was one huge pc of cake and bowl of bee hoon! Merry xmas to u n ur family...and a great new year too!